"This recipe has been a favorite for 30 years. Great at picnics as a side dish, where the guys gave it it's nickname (Blame the Dog). Serve this alone as a main dish with coleslaw and crusty rolls, or as a side dish." 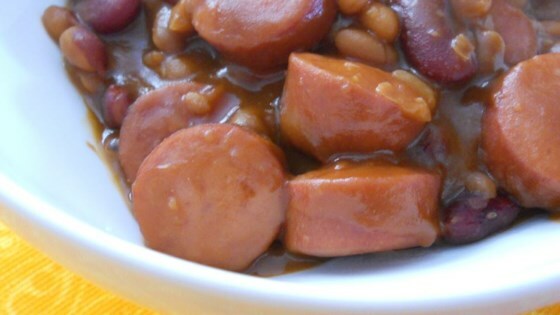 Combine sausages, baked beans, kidney beans, tomato sauce, ketchup, red wine, onion, celery, garlic, mustard, and Worcestershire sauce in a 3-quart baking dish. Bake in preheated oven until hot and bubbly, about 1 hour. This recipe may also be cooked on High for 4 hours in a slow cooker. You may need to spoon off some of the excess liquid from time to time. This is great for potluck suppers, and can really stretch a meal. Sometimes I even cut up a few hot dogs and add them in. Excellent! I added 1/2# of bacon, and browned the sausage and vegetables in about a T of the bacon grease. Will definitely make again. I added a bit of diced jalapeno to give it a kick. Skipped the celery, just didn't seem to fit. Super, the kids really liked it! used turkey sausage and turkey dogs. yummy, filling and perfect on a budget! Thank you! I doubled the onion and left out the celery and used liquid smoke instead of worcestershire, since that's all I had. It had a lot of flavor and only took a few minutes to assemble.